Rains have arrived and so have the woes associated with them. Particularly, rains and our regular footwear haven’t shared a cordial relationship. Hence, most men tend to opt for sandals. But they aren’t always the ideal choice for going to work or a happening social occasion. But that’s a problem of the past. As you broaden your idea of footwear, you shall come across numerous options to wear in the monsoon without looking dull. The intention behind this blog is exactly that. 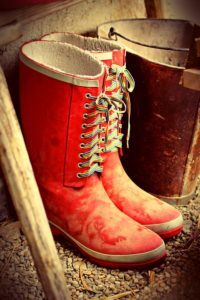 The earliest form of rain shoes can be traced back to the original Wellingtons in the 19th century. Taking their name from the Duke of Wellington who customised the shoes secured from German troops, the shoes soon caught up with the aristocrats in England. But these original shoes were made of leather. 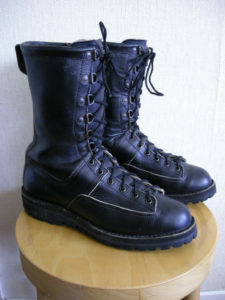 Rubber was introduced to the boots in 1853 by Hiram Hutchinson. By this time, the process of manufacturing Wellingtons got incredibly cheap. So, it soon became popular among farmers, soldiers in the world wars and eventually, the common populace. Since then, the number of options in men’s shoes for the rainy season saw an exponential increase. Today, there are different types of shoes for different needs people have in the monsoon. Let’s go through some of the popular types to figure what’s makes them ideal for the rains. Let’s have a look at the original footwear for rains. When it is pouring to the max, Wellingtons are the go-to choice for footwear. There are tall and short variants, each with their own set of advantages, Tall wellingtons look great, but most would find more comfort with shorter ones. If you are headed to work, wear these for the journey and pack an extra pair of formal shoes to wear at work. The inclusion of rubber sole in men’s shoes ensures that water seepage doesn’t occur. Also, such shoes tend to dry quickly. 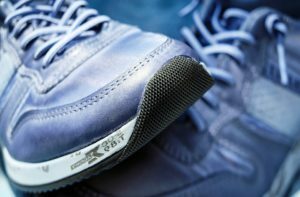 Add some extra waterproofing protection before slipping them on, and you have a pair of shoes that can dry up soon like it’s summer. 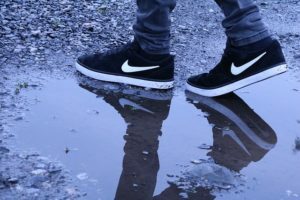 Sneakers tend to be soaked and smelly during the rains. But sneaker lovers can rejoice with ‘rain sneakers’ now. Made from waterproof materials, they come up to the ankle and feature subtle colours. One glance at them and it can be difficult to tell the difference. 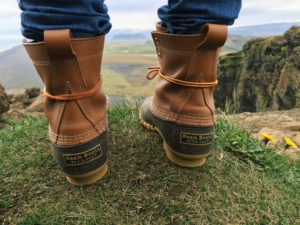 Not exactly office-appropriate, duck boots are great for those who like to head outdoors. They offer great warmth to the feet with its extra insulation and an interior that fits your feet like a glove. These are great to last for the long run. Waterproof leather boots have a rugged style to them while still having a high-end appeal. They are ideal for casual meetings and can even suit the casual office environment. If looking at a meeting with an important client or wish to look your formal best at work, Cordovan leather shoes are the ideal dress shoes to opt for. Cordovan is an equine leather that is known for its thickness, weather resistant quality, and also one of the toughest leathers on earth. They can pinch your pocket a bit. But consider this. They always look shiny and almost never crease. This is what you expect from work shoes, so it is worth the investment during the rains. 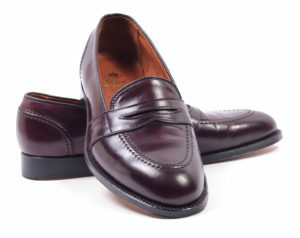 Those who wish to look crisp for work without shelling out much should consider getting waterproof leather shoes. There are many pocket-friendly alternatives made from water-resistant materials like synthetic leathers or gortex. Just ensure that you choose a pair that provides decent traction on the soles. As you have seen above, there are varied options in men’s shoes for the rainy season today. Almost every specific need that one can have is addressed in the wide range of shoes offered today. All you have to do is go ahead and grab them for yourself.